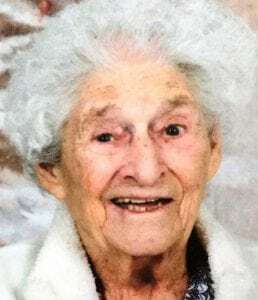 Westfield – Kathleen (Martin) Miller passed away on October 8, 2018. Born in Westfield on February 17, 1925 to the late Thomas and Mary (O’Connor) Martin, she was married for 60 years to the late Thomas J. Miller. Kathleen was a life-long resident of Westfield and worked for the Westfield Parks & Recreation Department for many years. She leaves her children Margaret “Peggy” and her husband Paul Carbonneau, and Thomas and his wife Susan Miller of Southwick, Paul Miller and Kevin Miller of Westfield and Mayre Miller and her husband Thomas Egan of Canton, CT. Kathleen also leaves her grandchildren: Daniel (Michelle) Carbonneau, Michelle (Tammy Bringaze) Carbonneau, Aron (Barbara) Atkins, Corenna (Jeff) Roberts, Teresa and Cristina Atkins, Andrew (Katie) Miller, Timothy (Cindy) Miller, Brian, Brendan, Ian and Carolyn Miller, and Brendan Egan; great-grandchildren: Abigail and Caleb Carbonneau, Samira and Greysen Bringaze, Linda Atkins, Katie, Lizzie and Emmy Roberts, Owen and Seamus Miller; a sister Maureen Martin, SSJ, cousin John O’Connor, sisters-in-law, Anna Jakus and Rene Martin, and brother-in-law William (Carol) Miller. Her daughter Linda Atkins and brothers James and John Martin predeceased Kathleen. The family wishes to thank her caretaker Karen Whalen and the staff of Armbrook Village for their love and support. She was a communicant of St. Peter and St. Casmir’s Parish and a member of their Rosary Sodality. Kathleen was also a member of the Sons of Erin. Calling hours will be Thursday, October 11, 2018 from 5-8pm at Firtion-Adams Funeral Home, 76 Broad Street Westfield. The funeral will be Friday, October 12, 2018 at 9am at the funeral home, followed by a Mass of Christian burial at St. Peter’s and St. Casmir’s Church, 22 State St. at 10 am. Burial will follow at St. Mary’s Cemetery. In lieu of flower, donations may be made to the Sisters of Joseph 577 Carew St Springfield, MA 01104 or to the Chalice of Salvation PO Box 1730 Springfield, MA 01102-1730.